It’s important to choose the right cabana construction company for your residential project in Walnut Creek and Hawkins Pools has extensive cabana building experience and a long list of happy customers. It’s always a good idea to work with a company that offers fully licensed and insured contractors, with experience, both of which you’ll find at Hawkins Pools. 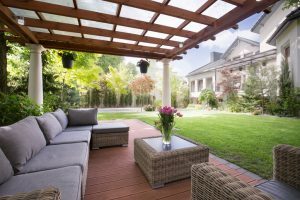 Our team of designers and builders have over 35 years of landscape design and construction experience, offering our clients their expertise in creating an ideal outdoor space. When you search for “cabana contractors near me” in the East Bay we hope Hawkins Pools is at the top of the list for options you will consider. Our team consists of a designer with 35 years of experience in landscape design and construction, as well as a building team of licensed contractors. We’re with you every step of the way, from the initial design consultation all the way through the entire build and even post-build maintenance or add-ons. If you’d like a customized cabana construction project for your Walnut Creek home, we can help. We specialize in complimentary yard constructions and can build structures that are enclosed or open-air, whichever you prefer. You can go as simple or complex as you’d like, budget and space constraints notwithstanding. A cabana can feature vaulted ceilings, a fire feature, lighting, sound, entertainment systems, and outdoor kitchen, and more. Our buildings are professionally constructed from the ground up and our team can run electric or gas lines as needed. In addition to cabanas, we also construct and renovate pools, guest houses, built-in BBQs, outdoor fire features, arbors, and more. You can rely on our team to provide excellent service and work with you on your project from start to finish. For your next “cabana contractors near me” search, we hope you’ll take a look at our San Ramon company. We’re currently serving East Bay cities for cabana construction and more, including Walnut Creek. Please call us at 925-886-1300 to speak with a member of our team and schedule a consultation or appointment.